Boil chicken with onions until fully cooked. Keep water and onions, take out chicken shred it and then put to the side. Add flour to cold water whisking then slowly add to chicken/onion broth untill thick, place chicken back in pan, chop and add green chili, in frying pan spray corn tortiallas with cooking spray and brown individually, then place a layer of chicken sauce, in bottom of baking dish, then place some cheese sprinkeled, layer five corn tortillas on top then complete the process like lasagana, then bake for 20 minuets. makes six servings. 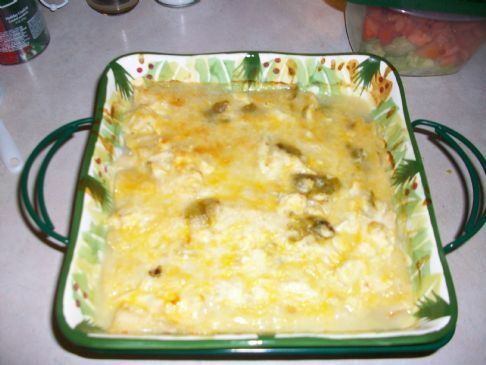 Recipe submitted by SparkPeople user JOEMELEAGLES. Thanks, I am still learning that you have to put all the instructions down I am so not used to writing out recipes! I live in New Mexico so our green chile (anahiem peppers)is fresh and super hot, I didn't realize that everyone else might not have access to the same great chile! Thanks again!